Staging your home is one of the most important things you can do when selling your property. Staging your home means dressing it in a way that attracts potential buyers. From curb appeal to welcoming warmth inside, your home should be in tip-top shape before it hits the market. Staging your home begins on the outside. Curb appeal is the first impression your house can make for a buyer looking for a home. If necessary, spray-wash or paint the exterior so that it looks fresh and clean. Make any repairs necessary to shutters, porches, patios, or other structural items. Once the exterior of your house is structurally sound and clean, remove any lawn ornaments, toys, or unnecessary items from your yards. Arrange patio furniture so it’s comfortable for conversation. Manicure your lawns and accessorize with bright, vibrant potted plants and flowers. The outside of your home should make potential buyers want to see what’s inside. Once you move to the inside, repair or replace anything that looks tattered, torn, stained, dirty, or otherwise damaged. When potential buyers see stained carpets and filthy walls, they begin thinking about discounts in your home’s value and allowances for carpet repairs and paint for the walls. Also, do a “sniff-through” of your entire home. Make sure there aren’t any offensive odors coming from bathrooms, kitchens, laundry areas, or trash cans as these can make buyers suspicious of other maintenance and upkeep issues with the property. Remove any personal items such as pictures, personal collections, political memorabilia, or other items that might make a potential buyer feel more like your company than a potential home-owner. Your potential buyers should be able to envision themselves living in your space and not feel as though they’re encroaching on your territory. Colors on walls and flooring should be warm, soft neutrals. You might enjoy those bright colors, but potential buyers may feel put off by bold color choices. Closets, cupboards, cabinets, and drawers in every single room should be simplified, organized, and de-cluttered. Potential buyers are going to open every door, drawer, and explore every nook and cranny of your property. Bathrooms should be clean. Scrub bathtubs, toilets, sinks, and floors so the bathrooms look (and smell!) fresh and clean. Mirrors and fixtures should be clean and sparkly. Dispose of used towels properly in a discrete laundry area rather than hanging over the shower curtain or on towel racks. Living rooms should be de-cluttered, cleared of personal items, and furniture should be arranged into comfortable conversation areas. Keep in mind that furniture that is pushed against walls can make rooms appear to be smaller. Furniture arranged into conversational groupings away from walls can help make a room seem larger than their square footage. Bedrooms should be neutralized, de-cluttered, and kept tidy for viewings. In all rooms where there are window dressings, your curtains or drapes should be properly installed to maximize the size and views from the windows. Hang curtains from the height of the ceiling all the way to the floor to enlarge window space, and keep the curtains open so potential buyers can enjoy the views. 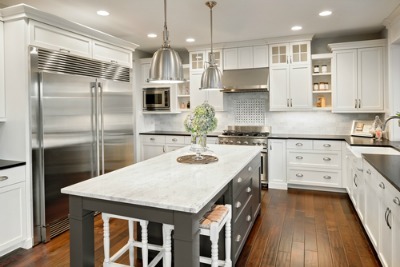 The kitchen is perhaps the most important room in the home because it’s where households tend to gather. Make sure sinks and floors are clean. Counter tops should be free of clutter and accessorized with lively, vibrant items such as flowers, plants, and bowls of fruit. Window dressings should be open to allow in natural light, and for views. Consider baking fresh-baked goods to have on the counter as well. Not only does this make the kitchen look livable, but it also generates a warm, welcoming scent when you walk into the room. Consider downsizing your collection of dishware and cutlery to the bare minimum while your home is on display. Cabinets and cupboards should appear to be spacious, decluttered, and well organized. Above all, your home should be free of any obvious items in disrepair or disarray. Everything should be clean, tidy, de-cluttered, and inviting. Staging your home is perhaps the most important thing you can do to invite potential buyers and competitive offers. Interested in learning more about staging your home so that it sells as quickly as possible? Call Doug Hansen at 616-485-8955.